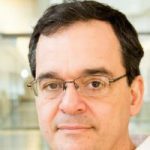 Jonas Almeida, PhD, Professor and Chief Technology Officer, Department of Biomedical Informatics, Stony Brook University (SUNY), “Data Science for Biomedical Informatics in the Planet of the Apps” at 11:00 am on Thursday, November 30, 2017, in Rooms 407A/B BAUM, 5607 Baum Blvd., The Offices at Baum. If you need to join the CCD Colloquium remotely, please follow the instructions below. You may click on the below link “Join Skype Meeting” to get started. Thank you.